You didn’t buy the DROID Turbo yesterday when the new Sapphire Blue ballistic nylon version dropped, did you? If so, you may want to ask Big Red for a price adjustment, because the price was cut this afternoon by $50 to $149 on-contract. The off-contract price dropped as well, from $599 to $549. As a recap, the DROID Turbo is the first DROID in years that hasn’t brought shame to the brand. Motorola did everything they could to maxx out this phone by tossing in high-end specs like a 5.2-inch QHD display, Snapdragon 805 processor, 20MP camera, massive 3,900mAh battery, and then covered it in Ballistic Nylon, which is awesome, by the way. 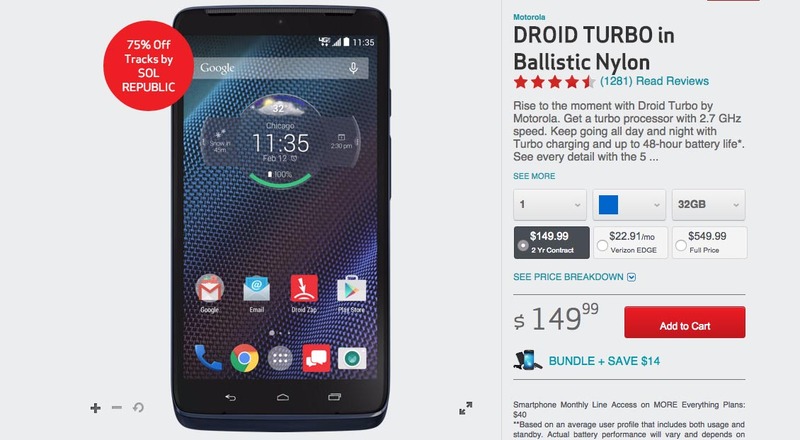 Be sure to read our DROID Turbo review if this phone is on your list. At $149 with a 2-year contract or $549 without one, you are looking at a deal worth considering even with the Galaxy S6 on the way.